If you're several months into a new diet or workout plan, results should be apparent by now. Either you're making progress, or things aren't going the way you originally hoped. If things aren't going well, you can still achieve your weight-loss goals and shed those hard-to-lose pounds without having to resort to crash diet plans and fitness boot camps. While such tactics have their place and can kick-start a lifestyle change, the smaller things can often make a big difference when it comes to weight loss. The idea isn't to guilt someone into trying certain methods, but rather to illuminate examples of common habits we all share that might be preventing us from shedding those last few pounds, and that can be broken with a little extra effort. Many of us live active, busy lifestyles that don't always allow us enough time to eat a healthy breakfast. As a result, we stop at Starbucks on the way to work and think nothing of grabbing a latte and a muffin. While this might be a convenient way to start your morning, you could be consuming as much as 45 grams of fat in that snack alone (for the average 2000-calorie diet, that's over two-thirds the daily recommended fat intake of 66 grams). Instead, consider buying ready-made fresh fruit bowls at your local grocery store. If you absolutely need that caffeine, consider switching to plain coffee rather than the fancy cream-based coffee-shop offerings. Additionally, keep in mind that coffee is a diuretic, meaning it dehydrates you of the vitamins and nutrients you consume at the most important part of the day—the morning. Whatever your current workout routine is, try finding an additional 20 minutes a day by waking up earlier or staying at the gym longer. Assuming you aren't a regular runner, try taking this time to jog two miles. This is a short-enough distance to minimize the likelihood of shin splints or other running-related injuries for the uninitiated. It might be easy to eat healthy most of the time, but the lunch hour offers plenty of temptations to clog your arteries with unnecessary fat. You might feel good about ordering that grilled chicken sandwich, but the french fries that might come on the plate are loaded with oily fat and useless calories. What about other appetizers and side dishes? They may taste great, but consider the fat content: corn chips, onion rings, calamari, refried beans—all pack an unbelievably high caloric and fat-gram count. When ordering your lunch, ask what comes on the side. If necessary, request a substitute—salad, cooked vegetables and fruit are wise alternatives. Try making an effort to break out of sedentary habits on the weekend. Instead, try a more pulse-quickening form of relaxation (this is not necessarily "working out"). Perhaps you spend a large part of your Sundays watching football, or lounging out by the pool. While these are luxuries we all enjoy in that sacred privilege known as "free time," there are ways to enjoy such time with recreational activities that are non-sedentary. 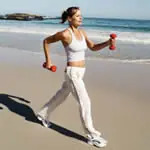 Walking the dog, going on a bike ride, kayaking or rock climbing, hiking on outdoor trails—these are all activities that can be enjoyable and relaxing while simultaneously offering light exercise.